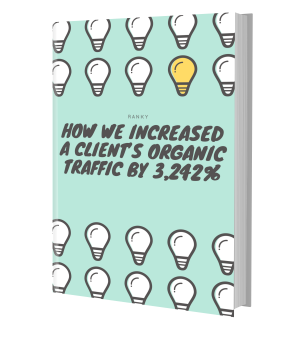 In this case study, we discuss how we increased the organic traffic numbers of one of our clients by over three thousand percent - all within less than a 2-year period! Examples that amplify the importance and advantages of mobile usability in today’s internet world. How we recognized the hottest trends of different industry niches, and responded in a way that best suited the client’s business needs. How we published high quality links to the client on Quora and Reddit, as well as major publications across the web. How we optimized the client’s blog and link profile and consistently monitored their website’s health. Ranky, one of the world's first inbound marketing agencies, boasts a portfolio of over 230 worldwide startups. Focus on HubSpot, Content marketing, Social media, SEO, PPC and more.